Zen Spa Roseville CA | SUMMER SKINCARE 101 – Defend yourself from Mother Nature’s double-edged sword. Sometimes nothing feels better than the warmth of the summer sun. Getting outside is good for us, right? Being active, fresh air, vitamin D…all that stuff. But time spent outdoors also puts us at risk of sun exposure. Yes, small doses of sunshine invigorate us and replenish our daily vitamin D requirement. 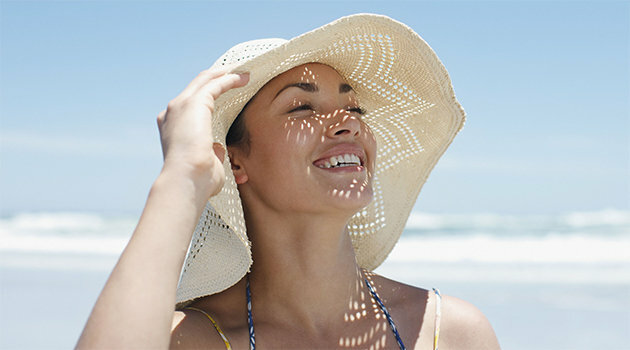 But prolonged exposure to the sun’s rays may initiate premature aging, sunburn and skin cancers. We all know the importance of wearing sunscreen, but some of us spend no more than a minute or so browsing the aisle and picking up the first product on special. Worse yet, most don’t reapply as necessary or apply enough in the first place. Experts recommend daily usage. A morning run, walking from your office to lunch, or sun through the car windows is enough to cause damage, especially when compounded daily. To be truly effective, a sunscreen must be labeled ‘broad-spectrum’, a term regulated by the FDA meaning it protects against both UVA (rays largely responsible for premature aging) and UVB (those causing sunburn). To only prevent sunburn by blocking only UVB is letting UVA rays wreak havoc on your skin. The FDA has recently banned misleading terms such as waterproof, sweatproof and sunblock. SPFs of 15 to 50+ (anything higher than 50 is labeled as 50+) are the only levels approved by the FDA to prevent sun damage. A skincare regimen including a hydrating moisturizer, plenty of water, effective sunscreen and regular facials can work wonders to stave off the negative effects of sun exposure. Make an appointment with one of our experienced estheticians to determine which facial treatment is most appropriate.